This iconic and unmistakable biplane has been superbly recreated by Canadian aeromodeller Bob Bishop, and is an excellent scale build for the more experienced modeller. The Gloster Gladiator is a personal favourite of mine, there's something very appealing about its chunky looks, huge cowl and unmistakable canopy - unusual for a biplane. 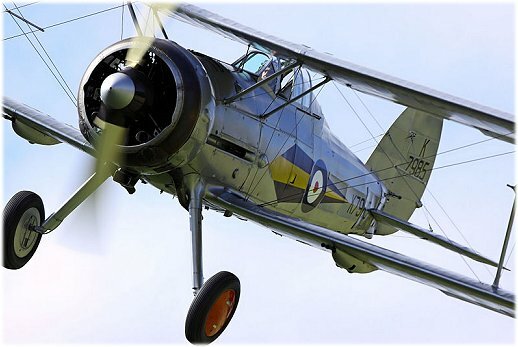 The Gladiator was a fighter biplane produced by the Gloster Aircraft Company in England. The prototype was developed in 1934 with its maiden flight in September of that year. The following year saw proper production plans and specifications being produced, and an initial order of 23 planes being placed for use by the Royal Air Force - things were hurried along because of the increasing threats in mainland Europe. Proper production shortly followed, and the RAF received their first Gladiators in 1937. Whilst the Gladiator did see active service in the beginnings of WWII, it was soon to be replaced by the new breed of deadlier monoplane fighters, namely the famous Hawker Hurricane and Supermarine Spitfire. It remained in service, for various air forces around the world, until 1943. Bob's rc Gloster Gladiator is a faithful reproduction at 1/5 scale, and can be IC or electric powered. It's a traditional balsa and ply build. Engine: 1.8 2-stroke or 4-stroke / Zenoah G-38 / Power 160 electric. RC Gloster Gladiator plan info. Bob's Gladiator is a large scale model, and the sheer bulk of the plane really exaggerates this! 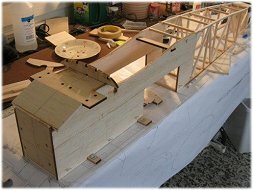 The plans were scaled up from accurate 1/72 3-view drawings, and modified for an rc build accordingly. There are no less than 9 plan sheets, all CAD-created, which can be purchased either in printed form, rolled and shipped in a cardboard tube, or in PDF format. This latter option lets you get the files printed off locally. 9 printed CAD plan sheets: $65. RC Gloster Gladiator plans - $65 plus shipping. RC Gloster Gladiator laser cut parts. 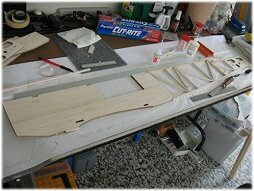 A set of laser cut parts for Bob's Gladiator is available to buy; the set contains all the balsa and ply shaped parts from the plan (wing ribs, fuselage formers etc.) but doesn't include the strip or sheet wood required for the build. RC Gloster Gladiator laser cut parts set - $350 plus shipping. Please use the Paypal buttons further back up the page to place your order for Bob's glorious Gloster Gladiator plan!